M.Sc., 1984, Department of Chemistry, Warsaw University, Białystok Branch, Białystok, Poland, "Design and construction of device for chronopotentiometric analysis and its application to studies of thiocyanate complexes of selected cations". Ph.D., 1997, Warsaw University, Department of Chemistry, Warsaw, Poland, "Influence of polarization potential on capacitance of bilayer lipid membranes". 1984-1987 - Laboratory of Physical Chemistry, Department of Chemistry, Warsaw University, Białystok Branch, Białystok, Poland, under supervision of Doc. Kazimierz Czerepko. 1987-1997 - assistant in Laboratory of Electrochemistry, Department of Chemistry, Warsaw University, Białystok Branch, Białystok, Poland, under suprevision Prof. Zbigniew Figaszewski. 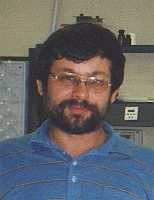 1997-2004 - adjunct in Department of Chemistry, Warmia and Mazury University, Olsztyn, Poland. 1987-1988 - Laboratory of Electrochemistry, Warsaw University, Department of Chemistry, Warsaw, Poland, under supervision of Prof. Stefan Minc and Dr. Paweł Krysiński. 1988, 1990, 1992, 1994, 1997 - International School on Biophysics of Membrane Transport, Poland. 1997 - Giulio Milazzo School on Bioelectrochemistry, Szeged, Hungary. 1997 - lecturer in Summer School on Biotechnology, Stegna, Poland. 1999 - two short working visits in Karl-Franzenz University in Graz, Department of Pharmaceutical Chemistry, Graz, Austria. 2000, 2001, 2002, 2004,2007 - 1-2 week working visits in Bucharest University, Department of Analytical Chemistry, Bucharest, Romania. Biophysics of bilayer lipid membranes (mechanisms of formation process, membrane transport, electrostriction, electroporation), taste and smell detectors, flow analysis, classical electrochemistry, construction of electronic measurement devices, automatization of measurements, development of detection methods for flow analysis (electrochemical, chemiluminescence, quartz crystal microbalance), development of software for controlling measurement devices, electrochemical sensors based on supported membranes.